A beginner’s guide with the goal to help beginner players to find some basic information to play The Settlers Online. I want to thank Moonlime for all the time and effort in putting this together. Here, you will find information to help you get started. Scroll down to the other sections of the guide or use the index tags above. As a beginner player, your first step is to follow your tutorial until you get to level 17. Do the quests and follow the Guide to Clear Your Island. You will encounter a few of the 0 Production Quests along the way. Follow the 0 Production Quest Guide by Giogino. Players will use abbreviations. Study the List of abbreviations by Greek_Spartan. The game has expanded so there will be more abbreviations that you will need to learn later, but learn these basic abbreviations first. 1-Keep your travel times short as you build your economy. Place production buildings around your storehouse to decrease the settlers’ walking times; thus increasing production. To help you visualize this process, use the Guide to Building Set-Up or Building Placement Efficiency [/b]. You will have more space as you clear your island. Re-organize later. Here’s how you can move buildings. You get 10 building licenses per sector you clear. Don’t forget to build a storehouse and check your mail for the licenses. 2-Focus on balancing your production as you build your economy. Click here to go to the Production Guides. Finally, click here for players’ useful tips to consider as you move along. Build to ratio to keep everything balanced. Use the Production Chain Ratio Guide by BB_Arad1 to help you. Don’t over-build. You can always add more buildings later after you have your basic production necessary to help you progress. Check your Economy Overview Tool often when building or upgrading to keep your production balanced. The Economy Overview Guide by BB_Dantesama will get you started. Upgrade your buildings when you can so you can produce more resources without adding more buildings that require building licenses. Check out the Upgrade Costs by Sinister-King so you can plan ahead. Don’t forget to upgrade the chain in the reverse order so you keep everything balanced as you grow your economy. Upgrade steadily as you can to produce more. Upgrading can be expensive, but it saves you space and building licenses. Click here to go to the Science Guides. Train your specialists for greater efficiency with the science system. Here’s the Science System Guide for the Geologists by LordStevie. Find the guide for Explorers here. Find the guide for Generals here. The skills you choose, will depend on what you value most. You might want to read the skill description and decide what you prefer. Some adventure guides will show you what skills you can use with certain generals. Check out the example . Click here to go to the Island Guides and get familiar with your island. After level 15 you can build the barracks and train troops to clear your island. Use the Guide to Clearing your Home Island to help you clear your island without wasting resources. Remember to build (and upgrade) noble residences to make room for more population. You can make settlers in your provision house with bread (produced in the bakery). Send your geologists to find mines and quarries twice daily if you can as you clear your home island. You will need those resources. 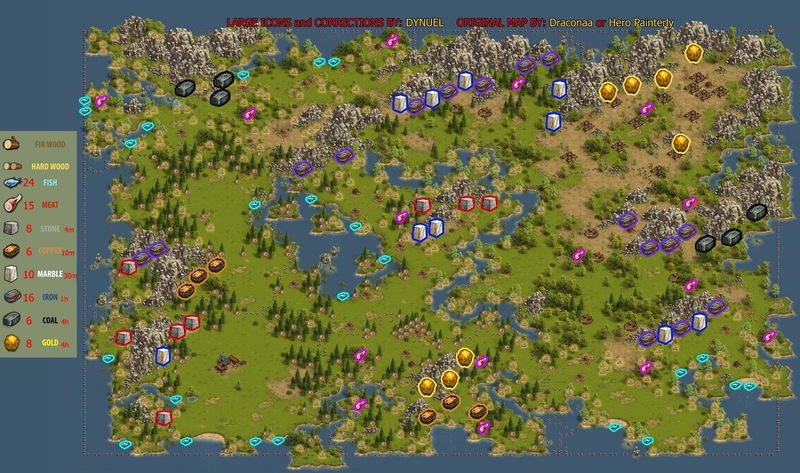 The Island Resource Guide by Draconaa and Dynuel shows you where the deposits are hidden. Remember to build a storehouse first and don’t delete those storehouses until you build a new one as they don’t move. At more advanced levels, you will be able to find more resources. Follow this basic guide for now. You can make buffs in your mayor house by collecting collectibles around your home island. Click here to read more about this fun feature. Certain collectibles can be found on the adventure islands only. After level 26 you start to adventure to gain xps and adventure resource loot. Click here to go to the Adventure Guides. Check out the Adventure FAQ and “How to” Adventure Guide by BB_Azariel. There are different types of adventures or missions such as resources, experience, epic, follow-up, fairytale, cooperation, event or ventures. Click here to learn more. Please note that these adventure guides are guides created by the Settler’s community. In cases where a guide has blocks, Settlers Online Support will not replace troops due to a failed block. Send your explorers to find the adventure maps. This Guide shows the find rate for each search/map. You can also buy the adventure maps in the Merchant or trade in the trade office. By now you might ask what in the world is blocking Tage sums up that “In a block, you attack more than one camp at once with the objective of not getting intercepted as you defeat the leader camp. If you want to try it, start with easy blocks such as those found in the Dark Priests adventure. Use the tavern generals to block as they are slower. Then use the fast general(s) to defeat the leader camp while the normal generals “block” the other camps. Practice makes perfect. How do the 2-player adventures work? If you want to learn more about how combat works, checkout the post on combat information by sparkz. Finally, if you want to simulate your combat fights to find better combinations, use the Combat Simulator by FastSimTSOmaps. At any point, you might wish to join a Guild. Click here to go to the Guild Guides. At any time during your gameplay, belonging to a good Guild, could help you to learn; make friends and advance further. Here’s what you need to know about Joining a Guild - Guide by the Settlers’ Online Wiki. Guilds have Guild Quests that pay you guild coins if you complete the quests so you can buy fun Guild items in the Merchant. Those items change occasionally via a community vote so be sure to vote when you can and collect those guild coins everyday. How to earn normal game coins? The Settlers’ Online game also has a vibrant trade office. Click here to go to the Trade Guides. You might want to sell/trade/buy resources as you go along. It’s a good idea to get familiar with how the trade office works in the Settlers’ Online game. First, read the Trade Office Guide by BB_Meesherbeans. You can use a price list guide as a rough trade guide. Prices fluctuate minute by minute so look for a price guide for your server that’s recent to help you set your prices. If you don’t have a price guide, search the trade office to see what’s already posted before you post your trade so you don’t over price or under price. Before you venture out to sell, buy or trade, read the Safety and Rules Guides. Check this out if you like the Auction style trading by Greek_Spartan. Read the Chat and Conduct Rules Explained by BB_Rawren. Read the Global-1-Help-and-Trade-Tab-Guidelines by BB_Meesherbeans. If you cannot find the answer to an in-game problem after asking your Guild, contact Support. New developments are announced on the news page (login page) so check it daily. You’ll also have fun with the Events. Back to the Beginner Guides. Foreign Settlers are created in the Mayor's House, middle tab.